The Accelerators for Microsoft Dynamics CRM provided additional functionality for your CRM application. Please see the below links if you are not already familiar with them. I’m did some research into modifications to the eService Accelerator to work with CRM Online. The eService Accelerator provides a sample portal that you can customize. The portal supports members of users and allows them to create customer service cases inside a Microsoft Dynamics CRM Organization. Some of the areas that required changes included modifying workflows, code changes to the portal, and how to invite CRM contacts to the portal site. 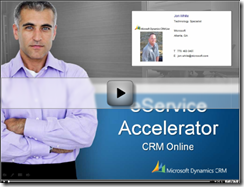 See eService Accelerator – CRM Online for a video that demos the portal and discuss the changes. Also check out these blog posts that discuss the Accelerators, if you are not familiar with them already.